Just tried an experiment, to understand Melanie's point that when you stand on a quad, you can only see three, you can't see the element that is your current POV. I added attempting to identify conflicts. Come with me now, as we circle the Wisdom-Enlightenment-Experience-Skill quad. Let me know what you think. about pursuing experience for those reasons. seriously, and it may disrupt the social order. may argue it’s not wisdom, it’s foolishness. It’s like standing on the surface of the earth and seeing the universe move around you without realizing that the ground you are standing on is also moving. You “freeze” your position on the earth so that, from your relative position, the entire universe appears to be revolving around you. Or if you “freeze” your position of being within your own body but do not freeze the position of the earth, then suddenly you’re not moving around on the surface of the earth, but rather you appear to be turning the entire earth beneath your feet as you walk from one place to another! In that way, I’d think one might see experience as frozen even while gaining (or losing) experience. And then the set of skills needed would appear to change accordingly. For instance, if one freezes experience while gaining experience, and the skill set needed remains unchanged, the one who is gaining experience will see the skill set as easier and easier to obtain as their experience gets them closer. If losing experience, they will see the skill set as harder and harder to obtain, even though skill remains unchanged. so you're arguing for a more technical, plus or minus view on the 'other three elements.' I can see that. It was a quick response, but more or less that’s how I interpret it. 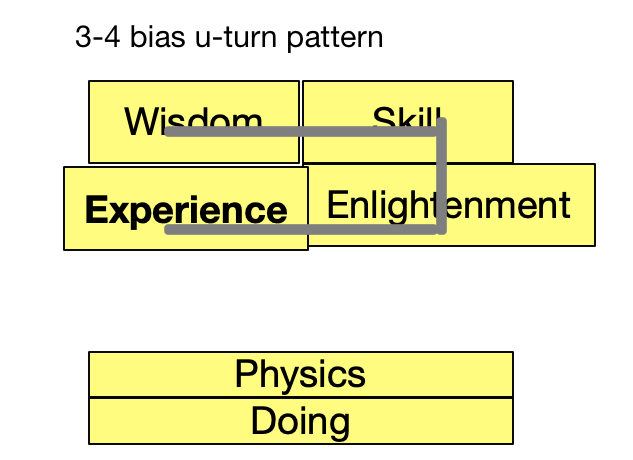 Considering Wisdom, skill, experience, and enlightenment are thematic explorations/judgments, it might have been better to say that freezing a moving experience might make an unchanging skill seem more or less important. What a GREAT example!! It would be awesome to go through all the Elements in the model and do the same thing. And @Greg too -- I love the visual analogy as well. I've always used that "Well, you're standing on it so you don't consider it" line, but having that visual makes it so much easier to understand. Indeed. I wonder if it would be different on each throughline? This is the "they" POV, Overall Story. Hey nice to know I got this one closer! Quadhandling is the skill of knowing what the list of treatments is, and which treatments to bring in which situations. Is there a way this can be used to get around one's own blind spots if you find yourself writing about the same kinds of things you struggle with and need to choose a storyform or want to do a litmus test on what you've got? I'd think that such a litmus test would be particularly useful for the MC throughline since it's so easy to get stuck thinking of the story from a subjective POV. If I've had the same kind of conflict as my MC, then it may be difficult to choose the right Elements due to personal blind spots. Perhaps if you're looking at a quad for MC that mostly feels right except for 1 element, that might be the author and/or MC's blind spot. I'm not sure what you'd do with that-- try assigning it as MC Problem? If I've had the same kind of conflict as my MC, then it may be difficult to choose the right Elements due to personal blind spots. I'll find the Problem/Drive of the IC and determine whether I believe that the IC has Changed. These have usually worked for me, but you're mileage may vary. I suspect the reason that it seems to work, though, might be because the IC is a "You" perspective, which likely doesn't look too different, from the MC perspective and the Author's view. This is interesting (can't see the element you're standing on), but I don't understand the applicability to the storyform and encoding. 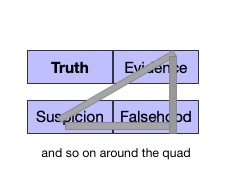 By saying "if you're standing on one element of the quad, you can only see the other three," does the "you" in that statement refer to personal perspective, ergo the MC Throughline? Is it just another way of saying, "you can't see what's causing you trouble, because you're in the middle of it, you have to look to the neighboring elements" ? So it's like the MC can't solve the MC Problem right away, because at first it can only see Symptom and Response, and only later it can identify Problem and Solution? For one, it’s a perspective on the problem. It’s saying when there’s an inequity among K, T, A, and D, the mind is saying one of these is not a problem. Saying one is not a problem is akin to standing on it. From that perspective, you are watching the other three elements flying all around (like being on earth and watching the sun cross the sky). I’m a little hazy on the theory here, but basically the mind is going to combine one set and divide the other. It’s this combining and parsing that makes one side look like a measuring stick. I leave all of that to the storyform to handle, but if I considered it specifically while writing, I would think of standing on K as not seeing that K is the problem which keeps the character from considering T. Instead, the perspective looks at A and D and decides that balancing those two will bring everything into alignment, so it tries to align A and D until the problem is solved or it sees that it can step on T.
Back to my analogy, if you’re looking at the sun and wondering why it rises in the east and sets in the West, it’s because you’re looking at the motion of the sun (focus) instead of the earth (problem). You can go about coming up with explanations for that, but you’ll never fully explain it until you see that the earth is moving too. Remembers me on the Emotional Equations from Chip Conley (Joy = Love + Fear). Jacks Painfull Desire: Jack has read all the books about screenwriting, he even learnt dramatica (Knowledge) but he cant bring the damn screenplay on paper (Ability) and starts to figure changing the subject (Thought). But it doesn’t work like this: You cant change your passion like underwear. This seems to be a good exericse to get a better grip on the issues..
Progress/Security = The people of the country fantasize about the possibilities of new freedom (Fanatsy) as the President signs the agreement (Fact) to relax the numerous sanctions (Thread) - until they are taught better. Subconcious/Dream = They dream to win with their football team the championship (Hope), of a real love (Denial) and of a better life waiting somewhere (Closure). Preconcious/Worry = Everyone knows the price (Value), but above all nobody cares much (Confidence) about the real value (Worth). This is how I'm starting to think...stay tuned on this, I'm re-reading some things and will see if I can make an index. 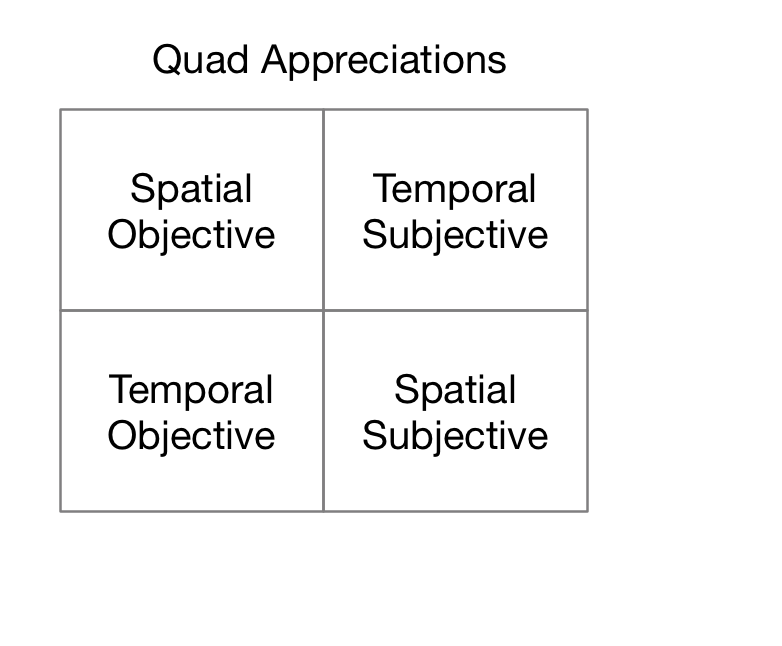 Quad appreciations should be like a catalog of algorithms. I use this one, in these conditions. I input this, I produce this, which I look at in this way, and use in this way, expecting these results. Simple. from doubt they can see investigation, appraisal and reappraisal. they made an initial appraisal, that first impression you always trust, but now it's eroding with new evidence, and after reappraisal you need to investigate to get the real picture. from investigation you can see doubt, appraisal and reappraisal. Now you're pushing ahead, pushing past doubt about the success of your effort, past your embarrassing mistaken first appraisal and being guided by your reappraisal that takes into account new information. from appraisal you can see doubt, investigation, reappraisal. Doubt is a small voice but you ignore it, as the context and appearances all seem right, investigation would have been rude, inappropriate, but doubt keeps eating at you and you can sense a reappraisal is coming, you're just trying to put it off as long as you can. from reappraisal you can see doubt, investigation, appraisal. Your appraisal started out great and then you got to watch it erode as you learned more and doubt built up and now an intrusive investigation looks like your only option. for each component of the quad. I guarantee you it will generate scene ideas. it tells you everything good and bad about us. the 'blind' spot is blind because it's the thing being expressed, but it's expressed as something. Doubt is expressed as investigation, appraisal, reappraisal. Investigation is expressed as doubt, appraisal, reappraisal. and so on. as usual if you can find that key phrase it unwraps what Dramatica is getting at. In the Star Trek example, Kirk's doubt, which Prish noticed was absent--in this case his LACK of doubt, was expressed as investigation, appraisal, reappraisal. It's why you don't need to mention his lack of doubt at all. It's 'the blind spot' because you can't see behind your own eyes. against the things that are pushing them away. more than they can handle. that looks good to them. ...these are actually kind of hard to do. it feels like brain gymnastics as you're twisting around how to express the idea.